Does your fire pit need that little extra bit of personalization to make it feel like your own? Well, with this Hearth Products Controls lava rock kit, you can add a unique aspect to your fire pit. 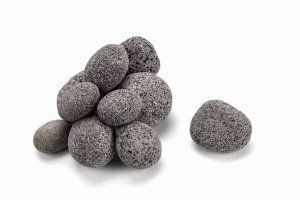 This lava rock kit has a realistic, rolled-smooth finish that will beautifully accentuate any fire pit or fireplace. The rock come in a dark gray color, and the kit contains small 1" to 2" pieces for adequate coverage. The amount included in the kit will provide 1/2 cubic foot of coverage for you to use as you please. How many pounds are included? The listed weight is 50 pounds.